The City University London event, chaired by Professor Roy Greenslade, will take place on Wednesday 4th February, from 6.30pm to 8pm. The book, which marks the 10th anniversary of the Freedom of Information Act, is co-edited by Tom Felle, Acting Director of Interactive and Newspaper Journalism at City, and former BBC producer John Mair. Freedom of Information laws - introduced in the UK on 1st January 2005 - are crucial in any democracy as they guarantee the 'right to know'. FOI laws can expose corruption and maladministration, and assure transparency in public decision-making. With contributions from more than 30 journalists and academics from around the world, the book examines the impact of FOI in the UK and more than a dozen other countries. The book reveals that investigative journalism is threatened because FOI is under attack from governments in a number of Western democracies. Hard won 'rights to know' are being lost as governments move toward more and more secrecy. FOI was a welcome development internationally but many countries, including the UK, are rowing back on openness. FOI is now being stymied by a combination of delay and deny tactics; requests for fees; and the increasing use of national security and commercial sensitivity exemptions. The book also explores the effect the WikiLeaks revelations have had on government openness. On the other hand, requests from journalists are becoming ever more ridiculous, and have included the costs of loo roll at Number 10; Loch Ness monster sightings; and preparations for alien attacks. To attend the launch, sign up here. Contributors to the book include: Peter Preston, former editor of the Guardian; former BBC correspondent Nicholas Jones; former executive director of the American National Freedom of Information Coalition Charles N Davis; and Canadian 'FOI Warrior' Ken Rubin. The event is being run in collaboration with The Media Society. Tom Felle said: "Ten years after the Freedom of Information Act was introduced in the UK, has it freed journalists to expose the dark secrets of our society, or has it just been an excuse for lazy journalism? "Our new book explores the impact of the law on British journalism and on how government and news is reported. "FOI was a welcome development internationally but many countries, including the UK, are rowing back on openness. And post Snowden governments are becoming ever more secretive. "Around the world hard-won access to government secrets is being compromised by the 'gaming' of FOI. Wide increases in 'national security' exemptions, delays and denials on dubious grounds are frustrating legitimate investigations by journalists. "On the other hand, many legislators complain that the act is being misused by the media for fishing expeditions and as a source for an easy headline. There is some merit in this complaint." 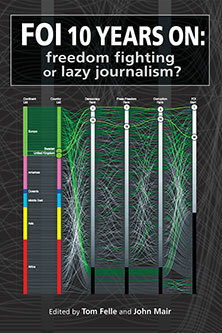 'FOI 10 years on: freedom fighting or lazy journalism?' is available now from leading bookstores and on Amazon. It is published by Abramis UK and is priced £19.95. To receive a copy of the book, contact Richard Franklin at Abramis UK, email richard@abramis.co.uk.